Our range of products include porcelain heaters, drum heaters and cartridge heaters. Matrusree’s Porcelain Heaters, offer a large heated area to the Gases, liquids or semi-solids to be heated when inserted into a thermo well. A Feature of this type of heater is that it may be removed for repair or replacement without draining the contents of the vessel. The sheathing Material may be M.S, S.S or Titanium or with clamp late, depending on the application. Open helical coils of high resistance wire is evenly stretched and laid through fluted refractory bobbins. These elements are then inserted into metal pipes of different diameters depending on the diameter of the fluted refractory bobbin, forming an integral part of the system. They are also welded to screw plugs of 1 ½” 2” or 2 ½” BSPT. Vertical heaters are provided with non-heating Zone, as they are required from top. Watertight terminal is available for this type of heater. Material such as oil, wax, fats and bitumen require low heater surface temperature to prevent product degradation. For these applications the Ceramic Bobbin heater are ideal. Other Specs, optional as per customer requirement. 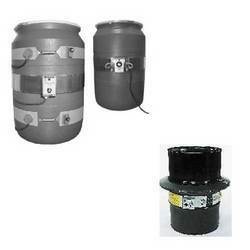 Matrusree Drum Heaters are used to pre-heat liquids in drums or pails to make them less viscous and more flow able. They are suitable heat sources when heat is required to handle liquids during pouring, dipping, coating or mixing operations. Matrusree drum heaters are made to brace a drum externally and they are easily installed and removed when needed. Matrusree drum heaters have a rugged construction, made to withstand the harsh industrial environment. They are available in two styles. The one piece construction heater that comes with a spring loaded handle and a snap action bi-metal temperature controller (220° F). The HDX model is a two piece construction heater that has a latch and trunion fastener with a bulb and capillary thermostat (250° F). Thermostat Control models sense temperature in an area remote from the heating element and will automatically cycle heater to maintain set temperature. Three-heat switch allows three wattage ratings per thermostat setting and voltage rating. Drum Heater comes with temperature controllers. When the pilot lamp is on, the heater is Active. Our models have bulb and capillary thermostats (250° F). Another models have snap action bimetal temperature controllers (220° F). After an initial trial these controllers have to be set in proportion to the maximum settings and required temperature. Matrusree Drum heaters are made for 120V or 240V power supplies. Appropriate power cords and plugs are supplied for each voltage and wattage. The power supply should be rated to handle the amperage drawn by the heater. Different liquids absorb heat at different rates so the wattage of a Drum heater should be selected accordingly. Since the Matrusree drum heater is not a sealed product, it should be used indoors and kept away from moisture and contamination. In general, these heaters are maintenance free. A periodic check to ensure that they are securely fastened to the drum is recommended. The power cord is rated to withstand 220° F and should never come in contact with the heater. Matrusree drum heaters should not be used on pressure tight containers, containers with explosive materials, or in explosive environments. Backed with the vast experience in this field, we are considered as the most reliable manufacturer and supplier of Cartridge Heater. 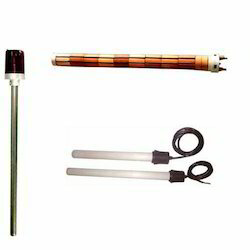 This type of Cartridge Heaters comes in a wide variety with specific applications with low watt density. The range of heaters which we offer are precision designed to suit blocks, dies, platens and are available in various wattages and watt densities.